Brisbane-based racer Paul Stokell (pictured above) is in the box seat to claim the modern title in the inaugural CAMS Australian Targa Championship. Michael Bray has all but sealed the race for honours in Classic championship in the 1975 Holden Torana he shares with Daniel Bray. 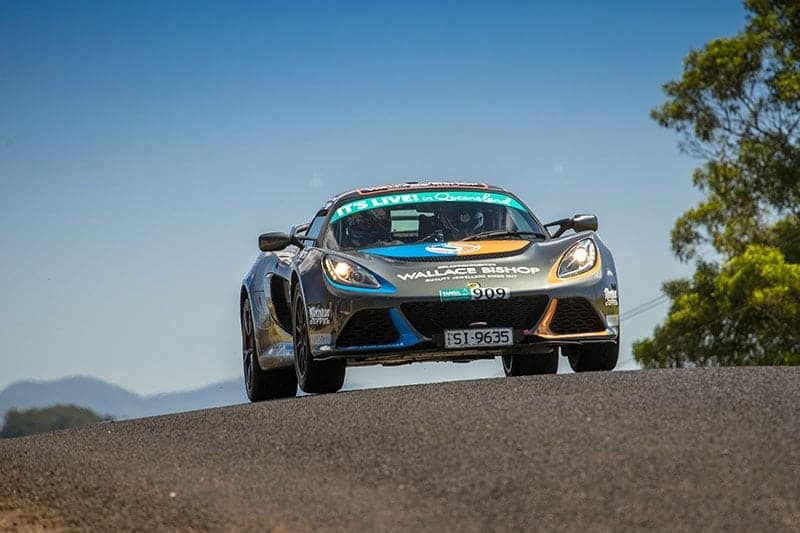 Stokell, the 50-year-old accomplished circuit racer, claimed second outright at the highly successful maiden running of Targa Great Barrier Reef earlier this month in his Lotus Exige to move into the points lead on 206. Relocating to Brisbane from his native Tasmania just over 10 years ago, Stokell combined brilliantly with his new co-driver, Kiwi Malcolm Read on the testing stages on the Atherton Tablelands. Read was the third different co-driver who has called the pace notes for Stokell in as many Targa events this year. The former topline open wheel driver has indicated his preference is to retaining the New Zealand co-driver for Targa High Country. The equation for Stokell to claim the title in Victoria means he essentially needs to finish such is his buffer to second-placed on the points table, Viper driver John Ireland. Fellow Viper driver John White backed-up his Targa Tasmania victory in Tropical North Queensland to move to third in the standings on 170, 10 clear of previous points leader Steve Glenney. White’s DNF at the opening Targa North West event earlier this year has proved the deciding factor. Similarly White is third in the GT2 standings on 170 points behind Ireland (192) and leader Stokell on 218. Peter Gluskie and Samantha Winter in their 1985 E30 BMW 325i remain the only threat to the Torana pair on 187 points. The Brays have all but sealed victory in Classic GT with 240 points compared to 1979 VB Holden Commodore pair Mick Downey and Jarrod Van Den Akker’s 174 points. There remains a tight battle in Shannons Classic Handicap with Gluskie and Winter moving into the lead on 185 points. Graham Copeland and Josh Herbert’s early exit at TGBR in their 1941 Jimmy’s Special has seen them sit second on 170 points while TGBR winners Ashley Yelds and Charlie Hughes are on 160 points in their 1961 Volvo 122S. In GT4 standings, Nathan and Nicholas Stokes clutch a 23-point lead following their third at TGBR in their 2012 Subaru STI with Steve Glenney and Andy Sarandis second on 170. Dutton Garage Early Modern is set with a cliffhanger finish with TGBR class winners Liam and Larry Howarth (1995 Nissan Skyline GTR) moving to 160 points, three short of Joshua Sutcliffe and John Mitchell (2006 Subaru). Howarth were handed the win in Tropical North Queensland following their late issues with the 2001 Porsche 996 Turbo of Tony Quinn and Kate Catford forced their late retirement after dominating the event. GT Sports Trophy standings sees Martin Duursma and Richard Wodhams (2018 Lotus Exige Cup 430) lead on 153 points over the 2004 Subaru Impreza WRX STI of Richard Woodman and Marcus Towle’s 125. Third in GTST is Anthony Grace and Craig Jones with the 2014 Subaru Impreza WRX STI pair on 109. The TSD Trophy, the Darryl and Peter Marshall are close to sealing the title in their 2002 Ford Pursuit Ute. The Marshalls have 170 points ahead of Peter and Tristan Taylor on 149 points. A total of 234 different cars and teams have now competed in the championship this year.